In addition, a 61st bonus game, Antarctic Adventure, will be available in an exclusive version at Dollar General. Sam's Club will have a version with the standard selection of 60 games, but a handful of additional overlays. I should have an extensive first look at the new hardware some time in August. Finally, for those interested in the history of the Coleco ColecoVision and 19 other of the greatest game playing platforms of all-time, be sure to check out my recent book, Vintage Game Consoles: An Inside Look at Apple, Atari, Commodore, Nintendo, and the Greatest Gaming Platforms of All Time. Would of been nice if the Nintendo ones were in there also. Well, we all know that Nintendo would never let that happen, so it's not that surprising really. That is such a great list - so many rarities, homebrews, and rarely-seen classic arcade games. 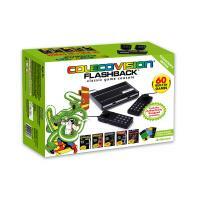 This one is a must buy for every retro gamer! Thanks for sharing!!! Looking forward to getting this, however I can't quite wrap my head around some of the omitted games. In particular there are two Universal titles (Space Panic, Cosmic Avenger), yet it lacks Mr. Do and Lady Bug. Could just be a case of they couldn't afford to include everything, but those seem odd to exclude. That said, I don't know what I'd be willing to swap out. Thanks for posting the list. The licensing is far more complicated than it should be, sadly. From a business perspective, you want to leave some out there for the possibility of subsequent releases, assuming this one is successful. No, War Room is its own game from Probe 2000 (Magnavox). It's a similar theme, but plays quite differently (it has a bit more depth). It's actually quite good. These controllers mimic the originals in just about every way, but should be a bit more durable. I should have a review unit soon. Actually those original Coleco controllers were very rugged. There basically easy to fix, and it's usually either a left or right switch or the joystick portion. eBay has tons of them for parts to fix/or build working ones from parts. Yeah I'll miss the Nintendo games for sure, but I got 'em for Coleco/ADAM.